Since HMs were removed at the start of the 7th Generation Pokemon Games, your Partner Pokemon in Pokemon: Let's Go, Pikachu will actually help you overcome these given obstacles. Instead of having to waste certain moves slots on your Pokemon in order to teach them the HM Moves you will need during your journey throughout the Kanto Region, your Pikachu will be able to do them all by possessing what will be known as Special Techniques. In the simplest of senses, your Partner Pokemon's Special Techniques act as HM Moves while outside of battle. Instead of needing HM Cut, your Partner will be able to remove tress by using its Chop Down Special Technique. 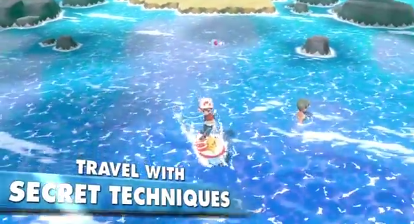 Instead of needing HM Surf, your trainer will be able to travel across water by your Partner using Sea Skim. And finally, you and your Partner will be able to soar through the sky by using the technique known as Sky Dash, successfully removing the need of HM Fly.